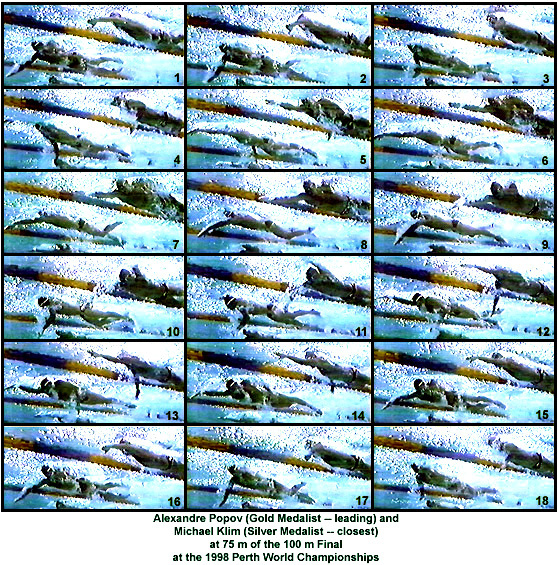 A COMPARISON OF ALEXANDRE POPOV AND MICHAEL KLIM AT 75 m OF THE 100 m FINAL AT THE 1998 PERTH WORLD CHAMPIONSHIPS. The time between each frame in this sequence is not known because it was captured from slow-motion video replay. However, the duration between each frame is consistent. Alexandre Popov is leading and furthest from the camera. Michael Klim is trailing and is closest to the camera. This is an unusual sequence for it allows a comparison between the two fastest 100 m freestylers in the world. Both have vastly different styles but are coached by the same coach. To fully understand these swimmers the individual analyses of each contained in this section of the Swimming Science Journal should be studied prior to considering this sequence in detail. Frame #1: Popov's right arm is at its greatest depth, is close to being under his body, and has the hand/forearm surface aligned for maximum propulsion. Michael Klim is at an earlier stage in his stroke. His initial repositioning moves laterally as well as vertically. This results from his straight arm recovery, which forces a wider recovery sweep and greater rotational forces that have to be counter-balanced under water. His recovery also restricts the amount of shoulder roll. Frame #2: Popov continues his direct right-arm propulsion by strongly adducting his upper arm. The sideward sweep of Klim's arm continues. Frame #3: Popov's right arm adduction is almost complete and the hand/forearm-propelling surface is completely under his body. That results in very direct propulsion. The degree of lateral movement in Klim's pull is shown clearly. His elbow is high and relatively close to the surface, which contrasts with Popov's under-the-body positioning of the pulling arm. Klim's propulsion is developed through upper-arm adduction but his lesser shoulder roll places propulsive forces at his side. Frame #4: Popov's right arm has completed its adduction and is extending, maintaining a propulsive force backward with a diminishing propulsive surface as it begins its extraction phase. The bubbles dragged behind his hand/forearm demonstrate the vigor of Klim's pull. It is notable that the orientation of his hand/forearm is primarily vertical at this stage of the stroke. That contrasts with Popov's horizontal and transverse propulsive position (see frame #3). Frame #5: Popov continues to extract and propel with the right arm while his left arm enters long in front of him and immediately seems to "grab" water. Klim's propulsion-at-the-side with his vertical hand/forearm continues. Klim's right arm enters. Klim's entry occurs earlier in relation to the "other arm" pull than does Popov's. From this frame on note how fast Popov's arm moves and the distance it covers in comparison to Klim's. Frame #6: Popov's left arm entry continues to "grab down" and the arm bends at the elbow. The upper left arm of Popov moves slower than the forearm to produce some medial rotation of the upper arm. Klim continues left-arm propulsion but his right arm does not "grab" the water with the same vigor or speed as that displayed by Popov. Popov's entering arm has already moved further in the same time period than Klim's. Frame #7: Popov's left arm is obviously in a propulsive position and his right arm has exited. In comparison, Klim's left arm has exited but his right has not yet begun to produce significant propulsion. Here is a stark contrast between the two swimmers. Popov employs a more continuous application of force, a very desirable feature, while Klim has a period of time where force is virtually non-existent. Frame #8: Both swimmers continue developing propulsion with Popov doing it faster, more efficiently, and more directly. Klim's right arm is drifting laterally as a result of his straight left-arm recovery. Frame #9: Popov is already developing backward propulsion with the hand/forearm surface whereas Klim has not yet reached that stage. Frame #10: Popov's propulsion is now under his head whereas Klim's is still well in front. Another striking comparison between the two is seen in this and adjacent frames. When Popov develops propulsive force through adduction it is performed with the shoulder still low in the water, a position that allows both the internal and external rotator muscles to be employed in adduction and force production. In contrast, Klim's shoulders are relatively flat as his recovering arm is well through the recovery while his propelling arm remains in front of him. Popov would either develop more relative force with his action or distribute the workload across more muscles than would Klim (Klim should fatigue faster). Frame #11: Popov's propulsion is further ahead of Klim's. Klim's shoulders are flat, which limits the amount of effective propulsion he can develop. The position of the propulsive arm relative to the recovering arm is different for each swimmer. Klim's pull is still well out to the side rather than under him. Frame #12: Both swimmers' recovering arms have entered the water. This means that they are rating the same. Popov demonstrates the "Kayak Principle" that is advocated by their coach Gennadi Touretski whereas Klim does not. It is interesting to note that Klim's propelling arm moves much further between frames #11 and #12 than does Popov's. This suggests some "slippage." Frame #13: Popov once again "grabs" the water immediately upon entry. Since Klim's entry is "early", his right arm still has considerable propulsion to complete, his left arm is momentarily suspended in front of him. Both swimmers' propelling arms are now at a similar stage. Frame #14: Popov continues to "grab" the water and reposition his right arm for effective propulsion. Klim's left arm is still held high and straight in front of him. Frames #15 - #18: Once again the difference between the swimmers in the early stroke aggression and efficiency and the degree of shoulder roll and its employment in the pull is clearly depicted. The underwater pulling actions, the recovery actions, and the timing of left-arm and right-arm phases are different between the swimmers. Alexandre Popov demonstrates a theoretically more desirable form of technique. It is testimony to the exceptional natural strength of Michael Klim that his performance levels can be so close to those of Alexandre Popov given the shortcomings in his technical skills. One is set to wondering to what would result if Michael Klim made the necessary adjustments to his technique.